Hello! My name is Jessica Zannini from Notes from the Portable. I am so excited to be joining the Primary Peach. Recently my classroom has changed. With two toddlers, I decided to stay at home for a few years and my playroom has become my new classroom. 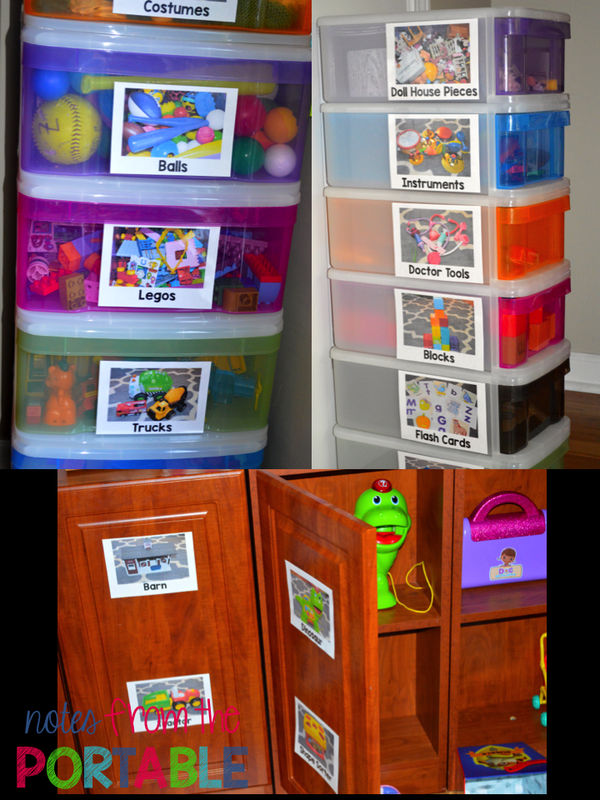 The goal in designing my classroom was to make it easy to use for myself and my children. Take a peek into our at-home classroom. This is where we start our day. We talk about where we are going (school, gymnastics, the park, grocery store, etc), and what we are learning throughout the week. 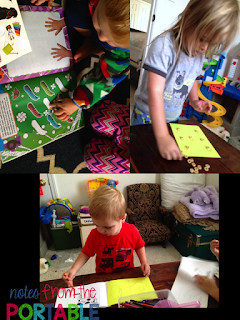 We look for the numbers, letters, and shapes for the week on our daily walks and car rides. The calendar I use a lot with my daughter. It has magnets and we use it for finding and ordering numbers. My next goal is to have images of our month. 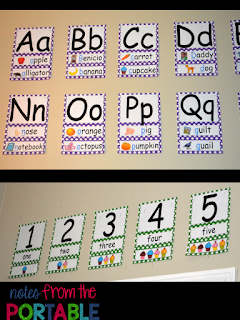 I want to put those up so they can see the pattern of what days they go to preschool and gymnastics. 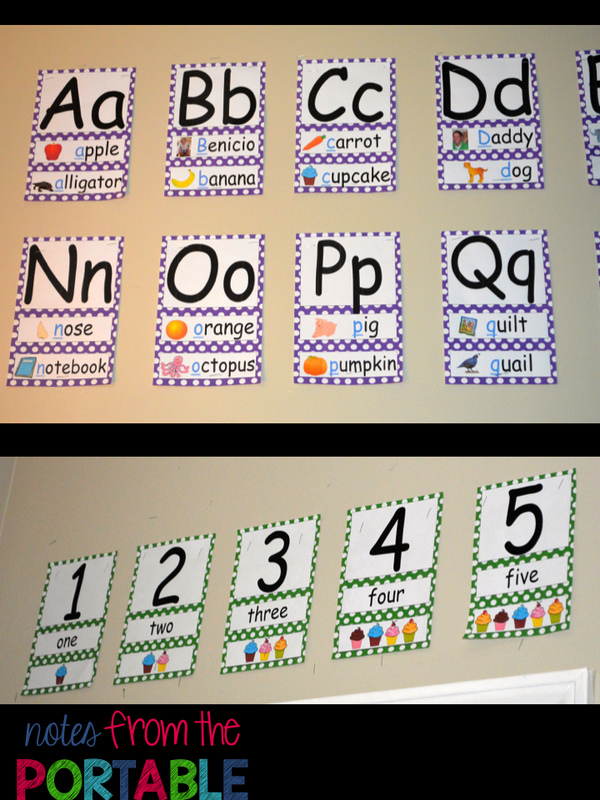 The word wall introduces the letters to my kids. I have it up higher on the wall so they can see it, but not touch it. 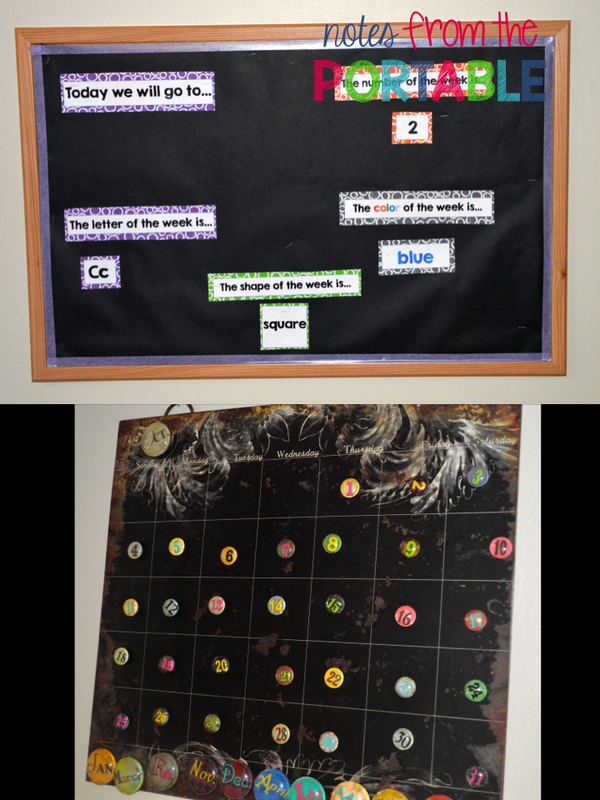 I used words that are high frequency for our household such as names, family, and favorite foods and animals. The number line has images of my daughter's favorite food...cupcakes. This book has the word wall that the kids can get their hands on. 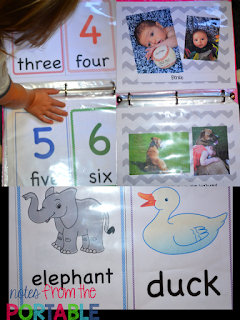 It also has family names, pets a pictures of common animals, numbers, shapes, etc. This is a book that the kids can read to me. I put these in page protectors so we can change them out or add items as needed. All of the toys have been grouped in separate tubs. 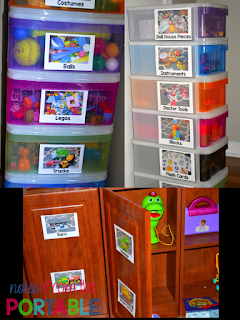 I took pictures of the actual toys in the tubs and added the word to each card. This way they are seeing the word along with an image of the toy. It has made a huge difference in finding toys, and having the kids help me clean up! 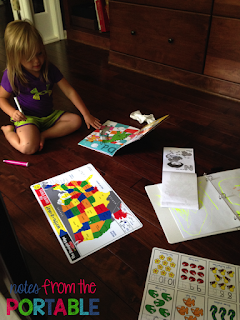 We use a variety of tools for their daily work (write on maps, place mats, sticker books, and home made books). 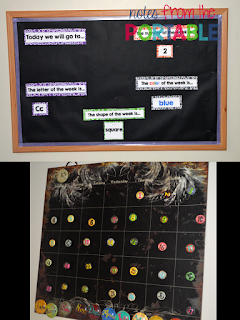 I create a book each week for the letter and number of the week. Between Educlips and Creative Clips, I am never at a loss for clipart to use in the letter of the week books. We place our snacks on the number of the week chart. This helps the kids practice counting to that number. The dollar store has so many great tools to use. 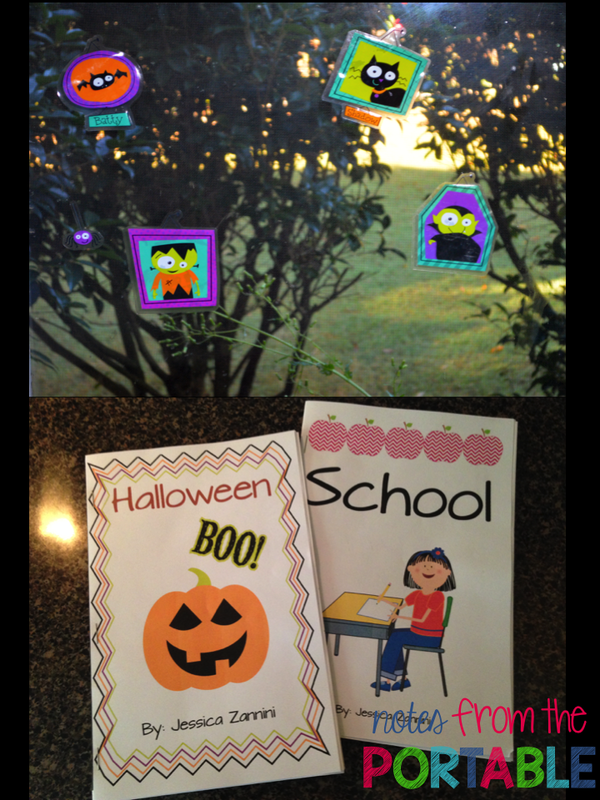 We get seasonal window displays and sticker books that help with learning vocabulary. 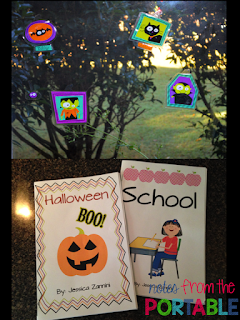 I also use the wonderful clipart I have purchase on Teachers Pay Teachers to create site word books for seasons and our activities. I hope you enjoyed the tour of my new classroom. Check out the schedule below to find more exciting classroom ideas!